In search for Korea’s cultural heritage and traditions and inspired by our fellow traveller Gunnar’s blog we left Seoul heading south-east, direction Andong. As booking a train seemed to be a bit more complicated than we could imagine we decided to take a bus for this around 3 hours long ride. It wasn’t a bad decision after all. The bus ride was very pleasant as it was equipped with business class like seats with enough space to recline and stretch out your legs. Unlike in other Asian countries, AC wasn’t set to minus 10 degrees and the ride was overall very safe. The main attraction in and around Andong is probably the UNESCO World Heritage listed traditional Hahoe Folk Village, one of the few such places that stayed preserved despite the war and rapid modernisation. We found out that some of the houses in the village offer accommodation too and so that was our plan. It is another almost 1 hour bus ride from Andong main bus station. The bus dropped us at the ticket office and for information about accommodation we were sent further, to the village entrance, connected with the ticketing area with a shuttle bus. Good news, there were still some rooms left and so the information lady called to find out some more details for us. That’s what we thought until the call was over: “Room is booked, the owner is picking you up here in 5 min”. Great! Or it would be great if 1, the village had an ATM and 2, there were any restaurants inside the village. By now (mid afternoon), after almost a daylong travel, we were already quite hungry, without cash, our backpacks weren’t getting any lighter, Lucia was already highly annoyed and so despite having our entrance ticket already bought we decided to return to Andong for the night. The train station information centre in the centre of Andong sent us to the Happy Guesthouse, which was supposed to be “good for foreigners” even though we weren’t told what makes more foreigner friendly than the other ones. Perhaps it was the lovely energetic lady – Ms. Young – who greeted us warmly and her broken English didn’t stand in her way of trying to tell us everything we needed to know, such as when we should leave for the Hahoe Folk Village tour, which places we must see and which will be the least busy at what time of the day. She also pointed out all the highlights of Andong with specific instructions. For example where we have to go for the best “fishy”, where is the chicken street with “chicken-chicken everywhere” and what time we should go and see dancing fountain at the riverside. She was also nice enough to show us more rooms and let us select the one with the best wifi signal, showed us how the hot water machine works and made our day happier in general. The room was simple with just a traditional mat on the floor. The highlights of our two-nights stay here were both breakfasts! We were served a delicious home-made pumpkin porridge and a few side-dishes and veggies. It was amazing! To top up the stay here, the lady gave us a korean traditional music CD as a souvenir. 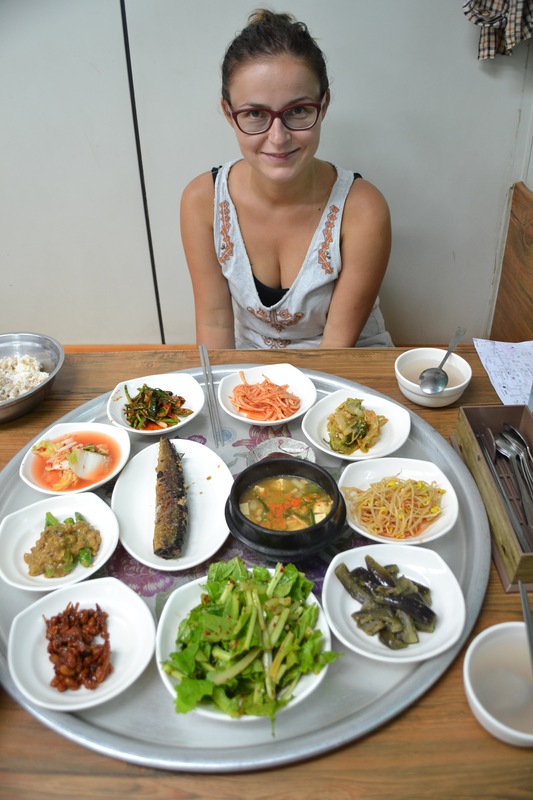 We did follow pretty much all her recommendations and tried both ‘fishy’ = salted mackerel and Andong “chicken-chicken”. The fish place was a tiny little room with only one menu item which always makes it easier to communicate with the older staff, we ordered ‘whatever you have for 2’. The reason why is the salted mackerel so popular in this landlocked region is because back in the days it was farthest from the sea where the fish could be ‘exported’ to be still safe to eat and preserve (in salt) and so the elite from inlands used to come here to enjoy this specialty. In the chicken street, except for the tasty Andong chicken, we also found many stalls with fish, pickled kimchi kind of things, ready food or funny socks. After the first night in Happy Guesthouse we got up early morning to make it to the Hahoe Folk Village before the crowds as advised. There are many traditional houses to see not only in the village itself. A two minute short ferry ride will take you across the river that encircles the village area to explore the other side. We found a house owned by an old man who took a break from reconstruction works, served us an icy sweet rice dessert and explained some other visitors in Korean about a history of his home. As people still live in these buildings, we couldn’t peek in everywhere, and only visit those houses that were converted into museums. One of the houses on a small hill serves as a tearoom. Ladies in traditional clothing seated us down, prepared and served us some tea and instructed us on how to drink it the traditional way. It is considered rude, for example, to show the bottom of your cup and so it should be covered with the second hand. In another house we got a chance to try some traditional village activities such as beating grain or carrying clay pots on top of our heads. Andong area is also famous for its soju (Korean liquor) and traditional masks production and mask dance performances. Unfortunately we only experienced the later. After the lunch we went to see the last building of the village – the mask dance theatre. In front of the packed audience a few masked performers made appearance: an old begging woman, a farmer, a cow who the farmer killed, an old man trying to seduce a beautiful girl and also people dressed as chicken. The performance was all in Korean but the story lines were quite easy to follow as you can imagine. Andong was a two-nights city for us and as we were still curious about the history and Korean traditional culture we took a train to Gyeongju, once a home of striving Shilla dynasty royal city. Have a look at our picture selection for this post in our Google plus gallery. Chceli sme preskúmať bližšie kultúru a tradície Kóreje a tak sme inšpirovaní blogom nášho známeho cestovateľa Gunnara vyrazili zo Soulu na juhovýchod do mesta Andong. Keďže kúpiť si lístok na vlak vyzeralo byť komplikovanejšie, než by sme chceli, rozhodli sme sa túto asi trojhodinovú cestu absolvovať autobusom. A dobre sme sa rozhodli. Cesta bola veľmi príjemná, keďže autobus bol vybavený sedačkami podobnými lietadlovej biznis triede s dostatočným priestorom na sklopenie operadla a natiahnutia si nôh. Narozdiel od väčšiny ostatných ázijských krajín, tu klimatizácia nebola nastavená na mínus 10 stupňov a aj šoférovanie sa nám zdalo bezpečné. Hlavnou atrakciou Andongu je asi tradičná dedinka Hahoe Folk Village, ktorá je aj na zozname svetového kultúrneho dedičstva UNESCO. Je to jedno z veľmi mála miest v Kóreji, ktoré sa napriek vojne a rýchlej modernizácii zachovali. Zistili sme si, že v niektorých z domov v dedine sa dá aj prespať a to sa stalo našim plánom. Z hlavnej autobusovej stanice v Andongu je to sem ešte ďalšiu hodinku cesty. Autobus nás vysadil pri pokladni na lístky, no pre informácie o ubytovaní sme museli ísť až ku vchodu do dedinky, kam nás odviezla turistická kyvadlová linka. Dobrá správa bola, že izby v našej cenovej hladine ešte neboli vypredané a tak sa nám pani pri okienku ponúkla zatelefonovať majiteľom a zistiť viac informácii. Aspoň to sme si mysleli, kým nezložila telefón: “Máte to objednané, majiteľ vás tu vyzdvihne za 5 minút.” Super! Alebo teda bolo by to super, keby po 1. bol v dedinke aspoň jeden bankomat a po 2. bola v dedinke aspoň jedna reštaurácia. Po celodennom cestovaní už bolo neskoro poobede a my sme boli hladní, bez hotovosti, ruksaky na crhbte sa nezdali byť lahšie a lahšie, Lucia už bola super otrávená a tak, i keď už sme mali kúpené vstupenky, že sa na noc vrátime do Andongu. Informačné stredisko na vlakovej stanici v centre mesta nás poslalo do hostela Happy Guesthouse, ktorý je údajne “dobrý pre cudzincov” i keď sme sa nedozvedeli, čo ho líši od iných hotelov nevhodných pre cudzincov. Možno to bola práve milá energetická pani Young, ktorá nás tam milo privítala a ktorej lámaná angličtina jej neprekážala v tom, aby sa nám pokúsila vysvetliť úplne všetko, čo potrebujeme vedieť, ako napríklad kedy je najlepší čas na návštevu Hahoe Folk Village dediny, ktoré miesta si nemáme nechať újsť, či ktoré máme navštíviť kedy, aby sme sa vyhli návalom turistov. Následne nám ukázala dôležité miesta Andongu so špecifickými inštrukciami ako a kedy ich navštíviť. Povedala nám napríklad, kde v meste nájdeme najlepšiu makrelu “fishy”, kde je kuracia ulička s reštauráciami s andongskou kuraciou špecialitou, “chicken – chicken všade” a kedy sa máme ísť pozrieť na tancujúcu fontánu na brehu rieky. Bola tak milá, že nám ukázala rovno niekoľko izieb a nechala nás vybrať si tú s najlepším wifi signálom. Izba bola jednoduchá, vybavená tradičnou podložkou na zemi namiesto postele. Asi najväčším prekvapením nášho dvojdňového pobytu boli raňajky! Dostali sme vynikajúcu domácu tekvicovo ovsenú kašu s niekoľkými prílohami. Bola skvelá! Ako čerešničku na torte sme pri odchode od milej pani dostali na pamiatku CD s tradičnou kórejskou hudbou. Odporúčania sme samozrejme skoro všetky prijali a skúsili sme aj jej “fishy”, nasolenú makrelu, a aj kuraciu špecialitu Andongu. Reštaurácia s rybou bola v podstate len malá miestnosť s jediným artiklom na jedálničku, čo nám určite uľahčilo komunikáciu so staršiou pani obsluhujúcou, a tak sme si objednali “čokoľvek máte pre dvoch”. Dôvodom, prečo je nasolená makrela tak populárna v tomto vnútrozemskom regióne je to, že sa nachádza na okraji oblasti, kam sa až dalo dovážať morské ryby, aby boli ešte čerstvé a dali sa nasolením uchovať. Bohatší ľudia z krajov ďaleko od more to tak sem mali relatívne blízko za touto pochúťkou. V kuracej uličke sme okrem chutnej špeciality našli aj rôzne stánky s rybami, sterilovanou zeleninou typu kimchi, hotovými jedlami alebo vtipnými ponožkami. Po prvej noci v Happy Guesthouse sme si ráno privstali, aby sme sa podľa rád dostali do Hahoe Folk Village skôr než davy. Nachádza sa tu mnoho tradičných príbytkov a to nielen priamo v dedine obkolesenej riekou. Dvojminútovou plavbou trajektom sa môžete dostať na druhý breh a preskúmať to aj tu. My sme objavili dom patriaci starému mužovi, ktorý si urobil prestávku vo svojej práci, aby nám ponúkol ľadový ryžový dezert a v kórejčine porozprával ostatným turistom niečo o histórii jeho pekného príbytku. Keďže tu ľudia ešte dodnes normálne bývajú, nemohli sme len tak nakukovať všade, navštíviť sme mohli len tie, ktoré dnes slúžia ako múzeum. Jeden z takých domov na kopci dnes slúži ako čajovňa. Ženy v tradičných krojoch nás usadili na podložkách na zemi, pripravili a servírovali nám šalku čaju a vysvetlili nám ako správne čaj piť. Tak napríklad sa považuje za drzosť ukazovať pri pití spodok šálky a tak si ju zospodu prichytávame a zakrývame druhou rukou. V ďalších domoch sme si mohli taktiež vyskúšať bitie akéhosi žita alebo nosenie veľkých hlinených nádob na hlave. Oblasť okolo Andongu je tiež známa pre svoje soju (kórejská pálenka) a výrobu tradičných masiek. Bohužiaľ, my sme zažili len to druhé. Po obede pri vstupe do dediny sme zašli na vystúpenie tanca v maskách. Pred plným obecenstvom sa ukázali vystupujúci v niekoľkých rolách: stará žobráčka, farmár, krava, ktorú farmár zabil, starec ktorý zvádzal mladuchu a aj ľudia prezlečení za sliepky. Vystúpenie bolo celé v kórejčine, ale príbehy boli, ako si viete predstaviť, celkom jasné. Andong bolo pre nás mesto na dve noci a keďže sme boli takto kultúrne-historicky naladení, vlakom sme sa vydali do ďalšieho kultúrneho centra Kóreje – mesta Gyeongju – strediska kedysi prosperujúcej dynastie Shilla. Pozrite si výber našich fotiek z Andongu v Google+ galérii.